1 Sep 2015 | What's new? 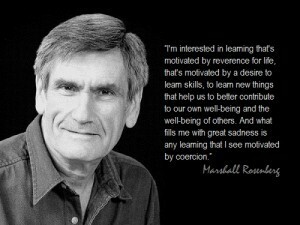 Marshall Rosenberg, doctor in clinical psychology, educator and recognized mediator in international conflicts, was the person who developed the Nonviolent Communication (NVC) and was the founder of the “Center for Nonviolent Communication” (NVC), in 1984. 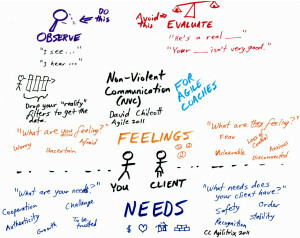 We talk about Nonviolent Communication to refer a “means to establish empathetic relationships with ourselves and with others with empathy and effectiveness”. “NVC begins by assuming that we are all compassionate by nature and that violent strategies—whether verbal or physical—are learned behaviors taught and supported by the prevailing culture. NVC also assumes that we all share the same, basic human needs, and that each of our actions are a strategy to meet one or more of these needs”. The ideal of the NVC is that the own needs, desires, yearnings, hopes … not met at the expense of frustrating the needs of another person. A key principle of the CNV that facilitates the execution of this goal is the ability to express ourselves without using judgments about what is right or wrong. For this reason, emphasis is made on expressing feelings or desires (needs) rather than expressing criticism or moral judgments. Of course is something that nobody has taught us how to do, like many things related with the emotional intelligence, but is something in what we can put awareness and try to learn and develop with the goal to have a healthy communication in the diferentes ambits of our lifes, that is in short, evolve as a human being. 4. express and hear more clearly what happens within us at any given time. Currently, The CNV is used worldwide as a valuable resource for communities facing serious violent conflicts and ethnic, religious and political tensions by their usefullness in “conflict mediation”.